You did an amazing job with your soup! I love the focals that you had to work with, you featured them beautifully! Wow Nat! So many amazing pieces. Your jewelry is always so incredibly beautiful. You were so prolific! Love all the pieces, each one has something special, so many medias involved! So many wonderful pieces from your beautiful soup. It's almost impossible to pick just one favorite. "Morning Frost" was the first, then my eyes landed on "Meditate". I've never really been tempted by fabric bracelets for myself but that one calls my name. "The Beach" is a sure win for me as I love all things "beachy". "Colors of Jade" & "Peaceful" look like fun pieces to wear and just my style; and finally I love the silver polish on those earrings. Just the right touch of "Sparkle". Such awesome work! You have such a wonderful collection from your goodies! I love what you did with all of them - I especially love the sparkly nail polish on the clear beads! So many calming pieces you have created - look like so much fun to wear! I love every one of your pieces and I also like how you named each piece. I think my favorites are the Winter's Day necklace and the Azure earrings. it was hard to choose, believe me. You did a wonderful job with each piece. The beads you had to work with are absolutely gorgeous, and the pieces you made with them are perfect settings for them. I'd have to say that I'm with you on the Colors of Jade and the Azure earrings being particularly wonderful -- isn't it fun when a piece almost makes itself? Oh, wow, you probably win the Gold Medal for the most pieces made out of the soup ingredients :) I kept scrolling down, trying to set my heart on a favourite, but I couldn't: the colours are my favourite ones, and the designs are quite variate, while keeping the pieces simple and elegant. Wonderful work! great sparkling designs!!! but my fav is fabric, blue bracelet, super! Natalie you made good use of your soup. So many wonderful pieces. Good job. It was smart of you to use that beautiful blue clasp as a bracelet focal. My favorite piece is Morning Frost. The nail polish added to the bottom of those earrings was the perfect touch. Very clever of you. So many incredible pieces! It's really hard to pick a favorite because they are all so wonderful in their own ways. Hi Natalie, It is wonderful to see all the ally cool designs you made!!! I like them all a lot! I think Morning Frost is my favorite and I love Peaceful and The "Azure" earrings. Great Job!!! Have a Blessed Mother's Day!!! A dash of bling is such a nice bracelet. Very simple, but so nice. All the other pieces are great too and have very nice colour combinations. Love the earrings. Your work is so elegant and refined. Beautiful soup , Beautiful jewelry !! that necklace with the oyster focal is stunning!! There is a very heavy ocean theme running through this years Party, which I LOVE!! I think it's safe to say that I really love your style! As I scrolled down through your post at each photo I thought "Oh, wow!" or "beautiful", etc. I just love every piece! Love them all. All pieces are so simple and so nice. Really great work. I'm amazed at the number of pieces your made - where did you find the time? Each one of them is unique. Your photos are great. My favorite is the wrapped bracelet- it just looks juicy! You came up with a lot of pieces....terribly nice to take that time to design so many piece. Good job. so prolific! I really like how you strung the pendant in "morning frost" and the simplicity in "shine". Very beautiful designs! Your work is lovely. I adore all for the bracelets. Loved everything, your names for each peace is bang on. All gorgeous peaces, I super love Winter's Day and Morning Frost, just gorgeous. Again, I'm overwhelmed. You made so many pieces and each one so good. Just your blue fiber one impressed me so much, and there was so much more. What were those focals made of anyway? Great work! Colors of Jade has to be my favorite of the set ! I love how simple yet elegant it is. Your whole soup is a complete winner, however, so making my choice was really, really hard ! Meditate is also smack dab in my tastes, the use of fiber is amazing ! Natalie - your soup is simply fabulous and just keeps on tantalizing the bead taste buds! Can't decide on my favorite. Love each one for different reasons. Your designs are inspiring! I like how you've named each piece so fittingly. Great Soup!!! All of your pieces are beautiful. You made so many! I'm so intrigued by your use of memory wire in the bracelet, "Peaceful." I never thought of using it that way, for just a section of a bracelet. So inspiring!! I love your style - just the feel of your blog and writing. More importantly, I love what you did with the bling bracelet. I've never seen these E beads used this way and it's adorable! Well done! It's good to see you beading again Nat! YOu make the most beautiful stuff! YOu know I love that shell one especially! What a wonderful assortment of techniques and beautiful designs. I love the sort of beaded chainmail effect you created for that bracelet. Beautiful Soup, you created a great variety of jewellery with... I love the name you gave to your jewellery! Oh, wow! Morning Shore and Meditate both make my heart sing! You did your beautiful bead soup justice!! So many wonderful pieces. I can't say enough about all the things you made! You used the word "simple" more than once, but each design uses the perfect elements put together in the perfect way. Little touches like the double jump rings on the bracelet or the silver nail polish on the clear stones (I LOVE IT) in the earrings. Wonderful work! All of your designs are top notch! Such a talented lady! I was drawn today to the peaceful bracelet ..if I stop by again it will certainly be one of the other pieces. And the nail polish on the earrings was such a cool idea! Really Really Soup-er! 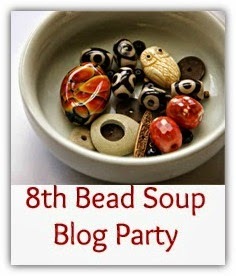 All of your pieces are beautiful - you did a great job with your gorgeous bead soup!! You got SO MUCH made with your soup. The soup itself had me ooohing and aaaahing, and your designs totally met up with that. I think you and I must have similar tastes as your favorites are also mine. Lovely! Oh my goodness!!! So many beautiful pieces!!!! I'm especially loving Colours of Jade! I want them all! I love the colors and design! You are truly gifted! I love the colors you use- great jewelry. All of these pieces are fabulous. Wonderful selections of color and design. But I'm most captivated by The Beach. That stunning blue shell focal and those vibrant blue beads are eye catching. Wow! what a lot of pieces you have made with your soup they are all lovely I really enjoyed seeing them.